Kitekite – is it the sacrificial track? Posted by SCe Comments Off on Kitekite – is it the sacrificial track? On 20 November Cllr Penny Hulse, chair of the Auckland Council Environment and Community Committee announced publicly that Kitekite Track will reopen before Christmas. Many will have applauded that move, with the opportunity to get back into the forested part of the Waitakere Ranges and the boost to local businesses. But there is a downside to this re-opening. It bears looking at why, of all the 90 closed tracks, Kitekite Track was chosen for the first re-opening and into the wider implications for visitors and Glen Esk Road. First, I need to recap a little recent history. Kitekite Track was closed along with many others in the forested areas of the Waitakere Ranges Regional Parkland in May this year because of the spread of kauri dieback. The Environment and Community Committee was responding to a rāhui placed over the forested area of the Waitākere Ranges by Te Kawerau ā Maki. Tracks in coastal areas or sealed roads stayed open. The Committee also allocated $750,000 to implement this and other recommendations. More funds have since become available. avoid high value non-symptomatic kauri eco-systems. These additional priorities have not been put before the Environment Committee and are said to have emerged from the consultation. However, the Buzz Channel consultation did not ask about “iconic destinations”. When people were asked to nominate specific tracks that should remain open, Kitekite Track was not nominated. Only 4% of respondents said Kitekite Track should be among priority track for upgrading and reopening. The approach of “iconic destinations” also flies in the face of earlier consultations on visitor management where the Waitakere City Council’s plan to highlight what it called “skite sites” was thrown out by West Coast communities. But that’s where Kitekite Track comes in. It certainly is “iconic” and has the largest number of commercial concessionaires of any track in the Waitakeres. The Council also plans to use Kitekite Track to demonstrate what a track looks like that meets the requirements of a Controlled Area Notice (CAN) to protect against kauri dieback. This means that on top of the usual numbers who throng to Kitekite Falls, we can add visitors excluded from the rest of the forested area, and people who are invited to take a look at what the new track surfaces look like. So how many visitors were using the Kitekite Track before it closed? The official estimate is 160,000 a year. Another estimate made from car counters showed as many as 28,000 a month at the summer peak. Visitors numbers to the Waitakere Ranges doubled between 2000 and 2010 and there is no reason to think that trend has not continued with Auckland’s rapid growth. Visitor surveys show that Kitekite Falls attracts more international and tourist visitors than other regional parks in Auckland. Over 20% come from overseas, over double the average for other regional parks. 85% of visitors came specifically to visit the place rather than en route to somewhere else. Kitekite Track has more tourism concessionaires than other parts of the regional parks network, and this includes canyoning, which inexplicably – it is afterall off-track and in the watercourse, both things we should avoid in controlling kauri dieback – regional parks management intends to allow to continue. The only reason given is that “it is allowed”. The concession for canyoning was given around 2000, long before kauri dieback was even known about. It is unfathomable why this permission has not been revisited. Anyone local will have noticed the huge increase in people attracted by social media who want to take “selfies” from the top of the falls and swim in the pool at the base. There were many signs of wear and tear already with widening of tracks from excessive gravel, vegetation being worn off stream banks as people went off-track and muddy slips at various points at the falls where people have created short cuts. Undoubtedly opening Kitekite Track and not others will place a great deal more pressure on the falls area. Pleas from myself and the Waitakere Ranges Board to reopen tracks in the context of a wider visitor management plan have fallen on deaf ears and generally gone unanswered. There are currently 270 kms of tracks in the Waitakeres. Many of these are closed and some are being decommissioned which will put greater pressure on open tracks. Surely it makes sense to have an overall plan that protects areas from over-use and ensures good visitor experiences? Recognising its unique values and popularity, Kitekite Falls area was made a Special Management Zone under the Regional Parks Management Plan. This is aimed at protecting the intrinsic values and wilderness qualities of a place while managing visitors, with caps on activities. Kauri ambassadors who policed the cleaning stations before the track closed, reported that it was difficult to get people to clean shoes when queues developed at stations. Recently, parks staff dismantled the bridge leading to Piha Valley Track, Byers Walk and Home Track: instead the plan is to funnel everyone through the Kitekite Track cleaning station if those tracks reopen. There is also a plan to create a loop by taking walkers along the sides of Te Ahuahu and Piha Roads, a dangerous route that the purchase of the Byers Block (Taitomo) was mean to avoid. It seems the policy is “bring the world to Piha” – it’s hard to see how anyone will get a wilderness experience while they are watching to make sure they don’t stand on the sandshoes of the person in front of them. The vast majority of people will come by car, but no thought seems to have been given to the impact on residents of Glen Esk Rd. We seem to have learned no lessons from experiences like those at the Tongariro Crossing or Ayers Rock. There is another issue. We have had three flooding events in the Piha Valley in the last 10 months: February, April and December. The Council’s report Piha Stream (Glenesk Road) Flooding Assessment, released in August, predicts the frequency of unsafe flooding in the area is once a year on average. The catchment is 1100 ha and steep, generating sudden flows. The time to peak flooding is only 50 minutes. Finding a warning system for residents that can work with this speed is proving a challenge. During flooding, large areas are covered in swiftly flowing water and dangerous debris and the road itself gets flooded, preventing access in and out. During the April flood, emergency services could not evacuate people as they had in February because it was too dangerous. The Piha Mill Camp at the end of Glen Esk Road has ceased taking over-night bookings and is currently closed. We are told by emergency services that the most dangerous things during flooding events are cars being shifted around by water and people trying to drive through flood waters. 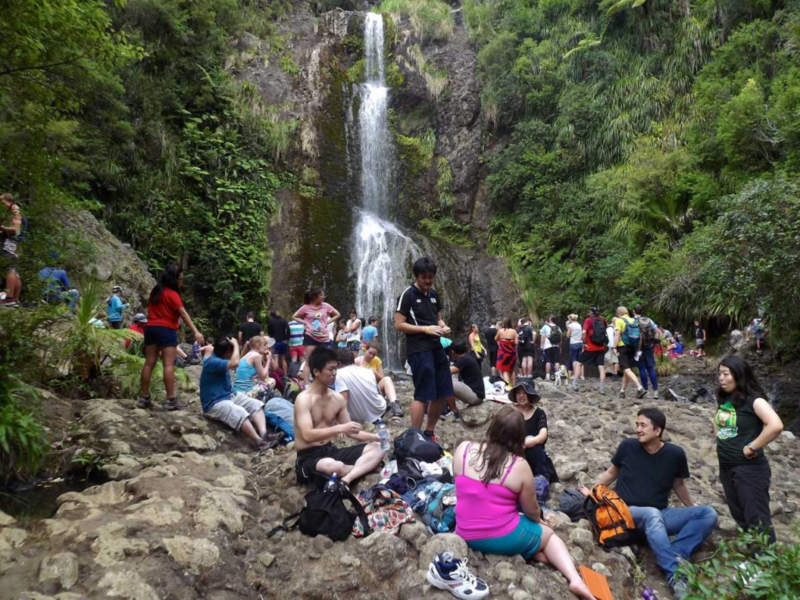 Yet regional parks management intends to invite large numbers of people into this catchment and It intends to use the Piha Mill Camp for visitor parking. Despite the fact that recent floods have not occurred in the depths of winter but during normally more moderate months, and despite the fact that in the February flood three fit young men died in the Cascades/Kauri part of the regional park, regional parks management is determined to press on. These issues have been raised with councillors and there has been no response. Neither has there been adequate consultation. A new consultation with the public is due to start but it will only look at which tracks should be opened from 2020 onwards. Decisions about track re-openings for 2018/19 have already been made. It is not intended to look at how to manage increased visitor demands until the review of the Regional Parks Management Plan in 2020. For the Kitekite Falls that may prove to be too late. In the meantime there is a real likelihood this natural treasure will be trashed and a maelstrom of risk created in Glen Esk Road. Sandra Coney was for nine years chair of the Parks Committee and led the first closure of tracks in the Waitakeres and Hunua Ranges in 2013. She chaired the development of the Regional Parks Management Plan and the current Regional Pest Management Strategy. She is a member of the Waitakere Ranges Local Board.